Heraldry: "Everything Old Is New Again"
And that old saw from the song seems even truer in heraldry. 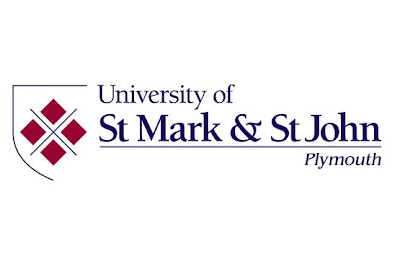 There was an article about the University of St. Mark and St. John (known affectionately as "MarJon") in Plymouth, England, "arguably the third oldest higher education institution in England," according to Gil Fewings, the University's resident archives assistant. Whether the university is or isn't the third oldest, it is nearly 175 years old this year (or, at least, its constituent colleges are). But Kerryanne Delbridge, Head of Marketing and Communications, said the identity of the institution had become confused. "In recent years the logos were replaced by the blue-grey 'swoosh' style that had been used since becoming a university college in 2007." That would be this little item immediately blow, a graphic designer's dream, no doubt, but not terribly good at demonstrating graphically what the organization is or what it is all about. because, as Ms. Delbridge notes, "The crest is complex as it consists of the lion of St Mark and the lamb of St John, together with other symbols such as a book, a flag, crossed swords and four squares positioned rather like the four castles on the Plymouth city coat of arms. After working on a number of possible concepts, we formulated a three-quarter shield design for our logo, which provides a modern twist to the original crest." She also states that "our original crest ... remains the anchor of our brand and ... will continue to be used in full for ceremonial occasions." So this is a pleasant example of an organization bucking the all too common modern trend by dropping a modern logo for its full coat of arms and a new logo based upon that shield. Good for you, MarJon! You ought to be held up as an example to all of the organizations which are dropping their "out of date" coat of arms for something "modern" (and which will often be dated itself in less than ten years! ).